In November 2008, Sgt. Glen Lehman was on combat patrol in Baghdad, Iraq when two armor-piercing grenades struck his vehicle. A sea of debris and blood emerged. The impact from the blast also tore through the tissue in his right thigh and shattered his left wrist. Lehman spent 18 months in recovery at Walter Reed National Military Medical Center in Bethesda, Maryland, where he completed physical and occupational therapy and learned how to use a prosthetic arm. 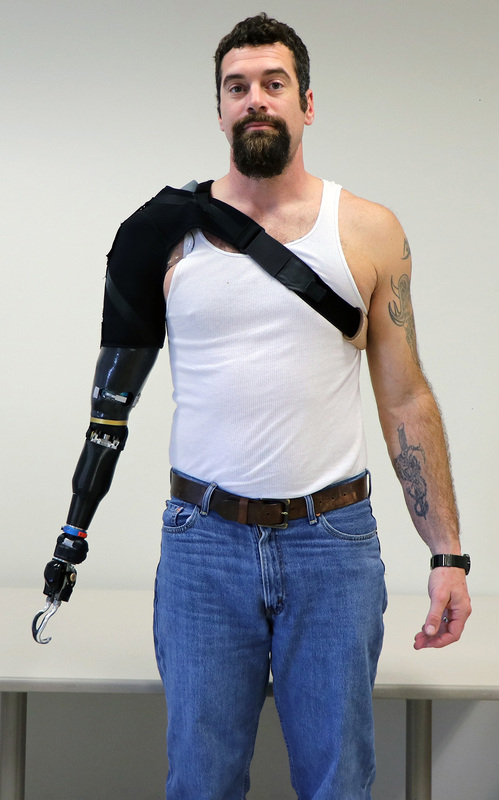 Since completing his military rehabilitation, Lehman has been frequently involved with research projects at the Center for Bionic Medicine, first as a patient who underwent Targeted Muscle Reinnervation, and now as a research participant who helps evaluate our prosthetic devices. A consistently bright and positive force, he most recently finished with a study looking at the effects of Targeted Muscle Reinnervation and use of a prosthetic arm developed by our group. The arm has a rotating two-degree-of-freedom wrist and was designed to be much lighter than other robotic prosthetic arms. He tested the arm with a hand and with a split-hook device attached to it instead of the hand, using the arm within our lab for experiments and also in his daily life for the home trial portion of the study. For anyone currently coping with limb loss, he provides straightforward yet valuable advice: a medical condition shouldn’t define who you are, and remember that recovery is an ongoing process.